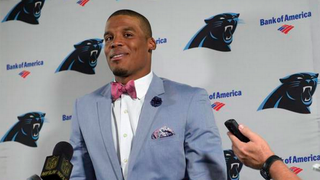 Cam Newton’s Fashion Sense: Hot or Nah? Carolina Panthers quarterback Cam Newton makes a fashion statement during the postgame interview Oct. 4, 2015. Carolina Panthers quarterback Cam Newton is getting major kudos for helping lead his team to a perfect 4-0 record with its win over Tampa Bay Sunday. But what he wears to the postgame news conference has become as newsworthy as what he does on the field. His preference for bright colors, crazy patterns, capri pants and fancy slippers have some questioning his vision. But really, this wasn’t the worst look he’s worn in the past. Who could unsee those capri pants with the lavender jacket and black slippers from last year? But at the end of the day, as long as he keeps winning, he can dress any way he wants. Perhaps we got it all wrong: Maybe it’s not the clothes that make the man, it’s the man that makes the clothes.